Arthur first appeared on a census in 1901 living with his family at 31, Croft Street, Staylybridge, Lancashire. His father, head of the household was Herbert Law, 31 a Cotton Weaver’s Overlooker who had been born in Bacup, Lancashire. Herbert’s wife, Harriet Law was 29 and had been born in Romily, Cheshire. Their only son Arthur 9, had been born in Stalybridge as had the other two children Florrie 7 and Elsie 3. Alice A. Law, 22, was listed as a servant. The 1911 census records the family still in Stalybridge, living at 4 Liston St. Herbert Law 41, was still a Cotton Weaver’s Overlooker. His wife of 21 years, Harriet was 39 and working in the Cotton Mills as a Cotton Weaver. They had 4 children born to them and 3 were still living. The listed children were Florrie 17 and Elsie 13 both Cotton Weavers. Also listed in the household was an Alice Ann Chatterton, Housekeeper, 32. (This is, we believe, is the same Alice A Law named incorrectly by the enumerator on the last census). There was a boarder – one Rose Ethel Tymms who was 19, a cotton weaver who had been born in Eagle Park in the USA. There was , however, no mention of Arthur Law. UK, Soldiers Died in the Great War, 1914-1919 accessible on www.ancestry.co.uk confirms some of the regimental information about Arthur Law and tells us that his birthplace was Stalybridge, his residence was in Shotton and he enlisted in Ashton-under-Lyne, Lancashire. His medal card also on ancestry details his medal entitlement. This source gives us his original regiment and number as well as the more recent one. Arthur Law’s Army Records have survived and are on www.ancestry.co.uk. He attested on the 12th October 1914 in Ashton Under Lyne and gave the address as 25, Cheetham Hill Road, Stalybridge. His occupation was Ironworker. He was 23 years old, 5 feet 7 inches tall and had a chest measurement of 35 inches with a 2 inch expansion range. He was certified fit for the 9th Manchester Regiment. His next of kin was his wife Elsie Law, Jersey House, Shotton, Chester Rd. His service in the army between November 1914 and May 1916 was all within the UK. He joined the British Expeditionary Force in France in March 1917 and then again in March 1918. There seems to have been a period at home that might have been connected to him suffering from ‘trench feet’. He was appointed temporary Lance Corporal in May 1915 but reverted to private a year later. He was transferred to the Notts and Derby Regiment April 1918 and once again promoted to Lance Corporal a few weeks later. He was reported missing on 27th May 1918 – killed in action. He had served for 3 years 228 days. There is correspondence between the Amy and Elsie regarding the receipt of his medals and the Commemorative plaque and scroll. The plaque and scroll were sent to her on the 28th March 1924 when she was living in King Edward Street Shotton. She was awarded a pension of 13/9d a week payable from the 3rd February 1919. It seems that Elsie remarried on the 3rd June 1922 at St Ethelwolds Church in Shotton. Her new husband was John H Yale . She completed a form for the army listing all the close relatives of her deceased first husband. These included her own name – then Mrs Elsie Yale, living in Alexandria Street Shotton. His parents Herbert and Harriet Law who were living at 20 Chester Road Shotton with their two daughters Florrie Wood 30 and Elsie Law 26. She named an Aunt Nancy Waterhouse who lived in Shotton and an Uncle William Law who lived in Stalybridge. Forces Genealogy and his Attestation Papers also mention the Regimental No, of 2600, Lancaster Regt and Corps – Manchester Regiment respectively. His wife and parents must have suffered for a long time, without the knowledge of where or how Arthur was and as everyone knows the “waiting game” is awful. The terrible news was eventually given to them after pursuing many people and organizations to find out about Arthur, bless them. “KILLED IN ACTION” – Officail intimation has only just been made to the wife and parents of the late Lance-Corpl. A. 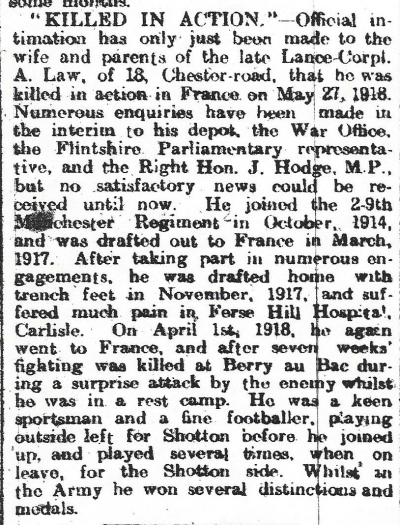 Law, of 18, Chester-road, that he was killed in action in France on May 27, 1918. Numerous enquiries have been made in the interim to his depot, the War Office, the Flintshire Parliamentary representative, and the Right Hon J. Hodge, M.P., but no satisfactory news could be received until now. He joined the 19th Manchester Regiment in October, 1914, and was drafted out to France in March 1917. After taking part in numerous engagements, he was drafted home with trench feet in November, 1917, and suffered much pain in Ferse Hill* (sic) Hospital, Carlisle. On April 1st, 1918, he again went to France, and after seven weeks’ fighting was killed at Berry au Bac during a surprise attack be the enemy whilst he was in a rest camp. He was a keen sportsman and a fine footballer, playing outside left for Shotton before he joined up, and played several times, when on leave, for the Shotton side. Whilst in the Army he won several distinctions and medals. There is a G. Law named on the St. Ethelwold’s Roll of Honour. Should this have been A Law? Did someone make a mistake?